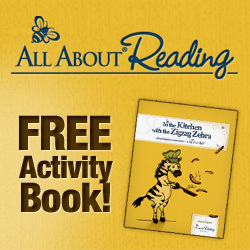 When the author list for The Virtual Book Club for Kids was announced for the year I was delighted to see Dr. Seuss on it. I had trouble narrowing down which book to do for the blog hop, but my children made the decision for me. 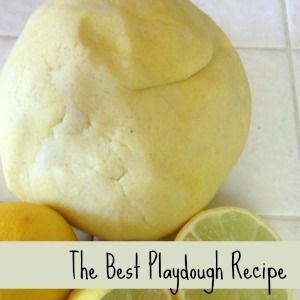 The other day I made a batch of Flubber using the recipe from Mom to 2 Posh Little Divas. 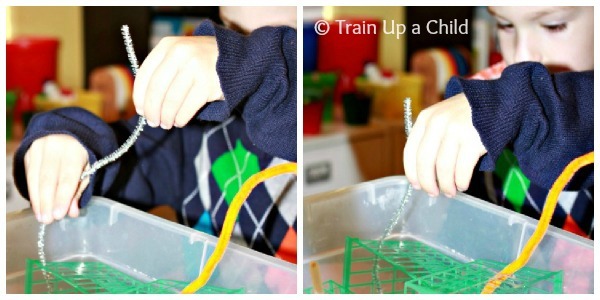 Without any prompting J-Bug (5) and JZ (3) called the slimey sensory material gluppity glup. You might be wondering what on earth is gluppity glup? Gluppity glup is a messy and icky substance that is being dumped into the pond where the Humming-Fish hummed, so they are leaving to find water that isn't so smeary. Gluppity glup is from Dr. Seuss' The Lorax. The Lorax is one of JZ and J-Bug's favorite books. They almost have the entire book memorized and like to "read" it to me. While we were playing with the gluppity glup I had an idea. I set up an invitation to make a town out of Mega Bloks and Tubation pipes to dump gluppity glup and schloppity schlopp all over. First JZ built a city using the Mega Blocks and Tubation pipes. He added pipe cleaners to represent what was left of the trunks of the truffula trees. I included the strawberry baskets for two reasons. 1. I needed something to stick the pipe cleaners in to make them stand. 2. I knew the gluppity glup would ooze through the baskets making a cool effect as seen on Familylicious. Once the town was built JZ grabbed the gluppity glup and eagerly pulled it out of the container. He really surprised me by finding a spot for the gluppity glup and leaving it there. I thought he'd play with it for awhile and spread it around. I should have known. Schloppity schlopp is his most favorite sensory material in the world. To create schloppity schlopp we made Oobleck. 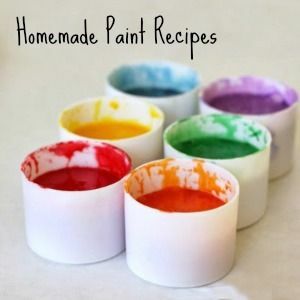 Oobleck is made by combining cornstarch and water. As always when we made Oobleck, JZ had to play for a bit in the cornstarch. It really has an amazing texture and feel. We like our Oobleck, er schloppity schlopp a bit on the thick side, so we use more cornstarch than water. 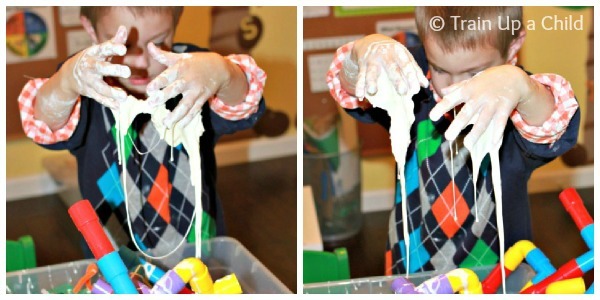 If you haven't played with Oobleck yet it really is a must try! 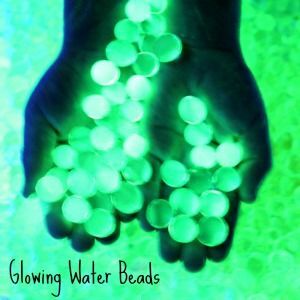 We've made it GLOW and experimented with color mixing and even taken it in the play pool. JZ loved watching it drip onto the city! He was in little boy heaven. We read a good book, constructed a city, then made a big mess! What more could a little boy ask for? It was fun to see that while JZ was mixing up a batch of schloppity schlopp the gluppity glup had oozed around and spread throughout the city a bit. The point of the gluppity glupp and schloppity schlopp in The Lorax is how big machinery and factories create smog and present a danger to our health and to the health of animals. I think our demo created a simple yet perfect example for JZ to understand. As much as the gluppity glup oozed, the schloppity schlopp dripped. We were left with a giant mess of goo. 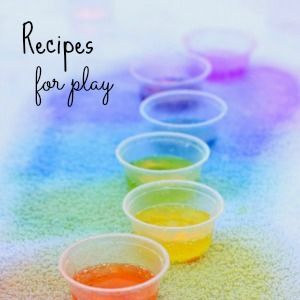 We played in it and mixed the two recipes together for extended sensory play. J-Bug joined us later in our play when he woke up from his nap. He cracked me up by continually quoting the book, "Your machinery chugs on, day and night without stop." 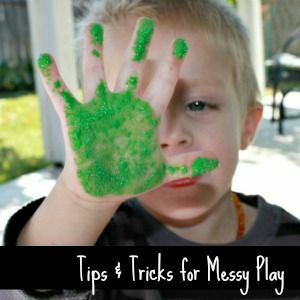 For more ideas for messy play follow me on Pinterest. 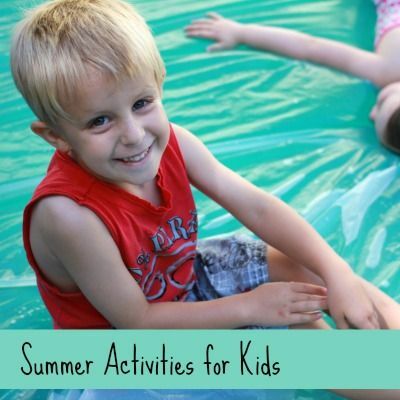 And finally, if you have blogged about an activity inspired by a Dr. Seuss book we'd like to invite you to join link up your post. 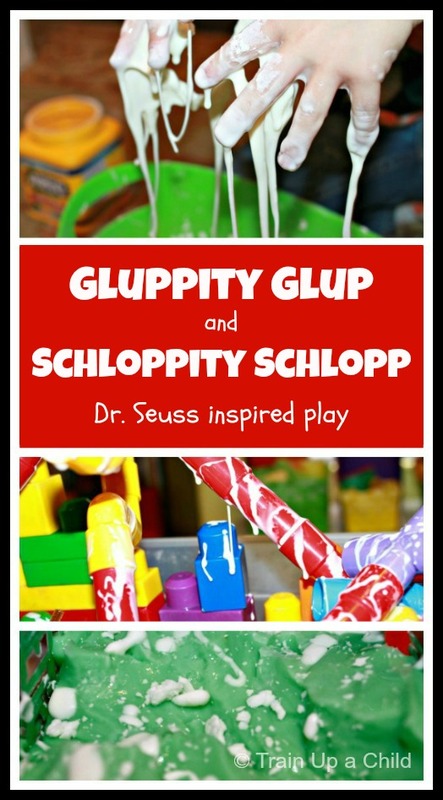 When we read about gluppity glupp and schloppity slopp in the Lorax, I immediately thought of oobleck, gak, or some other messy green fun. Love it! I kind of want to play with the gluppity glup you're showing, myself! Love it! 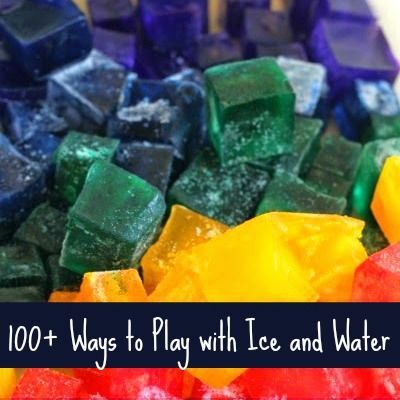 What a fun sensory experience. Oh, my goodness! That looks like so much fun! I know my boys would love to do something similar. 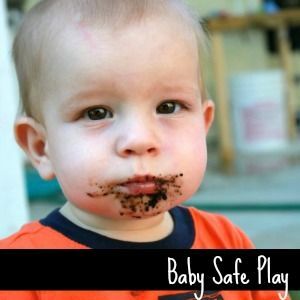 You are one brave mom to encourage such a big mess! :-) I need to be more willing to let my kids explore even if it means a big clean up when they're done. JDaniel would love all the dripping mess! What fun! 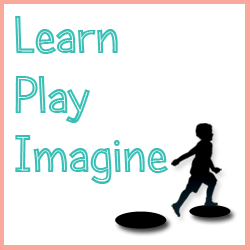 I will be sharing this post on the Read.Explore.Learn. Facebook page and on Pinterest.